This program is really very simple. When you drop your used wine corks in one of our collection containers, you divert a 100% recyclable material from the solid waste stream and give it a second life as a new product. When we first launched our program, we consolidated shipments of your corks and sent them to the only cork recycling facility in Canada — the Jelinek Cork Group — one of the oldest, continuously active cork companies in the world. 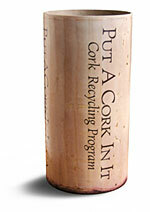 Their cork recycling program was the first of its kind in North America. They are headquartered in Oakville, Ontario. The group specializes in, and works with, cork — from the forest level to the final product. Jelinek remanufactures your used wine cork primarily for construction materials such as cork underlay, cork flooring, acoustical cork wall tiles and cork fabrics — all of which qualify for points under the Leadership in Energy and Environmental Design (LEED) Green Rating System. Before long we realized the logistics of transporting the used wine corks were challenging – both in the collection process and shipping them for reprocessing. Our catchment area for collecting corks is primarily Greater Vancouver. We have interest from, and participants in, the Okanagan wine region, but even getting the corks from interior BC to Vancouver has been challenging. Delivering them to Jelinek in Oakville is also prohibitively expensive. And for a green initiative, we had to wonder about the impact of transportation emissions. So the current plan is to continue developing options to reprocess the corks locally. Our most promising current direction is producing cork ’tiles’ for use as flooring or wall covering. The jig we require for this will be expensive, so we are considering crowd-funding its development. In the meantime, the sale of used corks to crafters helps with cost recovery for the program. So please keep those used wine corks coming. Please remember, natural corks only — no plastic stoppers. Thanks!